Once you’re seated, you’re given your choice of teas. 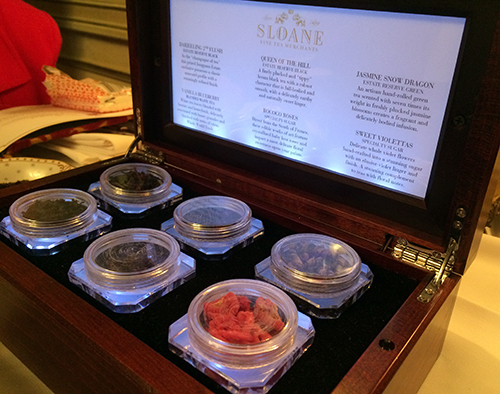 I loved that they brought them over in a little box with samples that you could smell. The first box has the regularly offered teas, and the second on that lit up was the special reserves collection that you needed to pay an $8.00 upgrade for. They also brought two extra tea samples of holiday teas that were only being offered for the season. 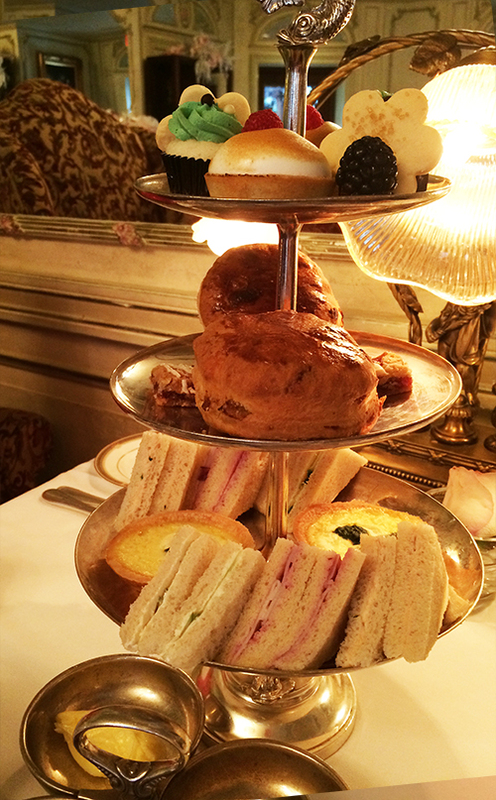 The traditional afternoon tea comes with a selection of sandwiches, pastries, and a delicious scone. Finger Tea Sandwiches: Four Selections of Gourmet Sandwiches, Prepared on Fresh Breads. Pastries: Four Delicious Selections Designed by Our Pastry Chef. You can get different things depending on what type of tea you choose, but cheese and wine is another option. The the full afternoon tea menu is available on the Prince of Wales website. For sandwiches we had cucumber, turkey with cranberry, and salmon. The pastries included cheese and spinach quiche, shortbread cookies (for the season), a lemon curd tart with an almond crust, and a little vanilla cupcake, which I’m sure had a fancy name. After much deliberation I chose one of the holiday blends that they had. Unfortunately, I can’t remember what it was called but when I smelled it there was a very strong apple scent to it. I assumed that it would be something more similar to an apple cider, but the taste was definitely different from what I expected. It was sweet with a hint of apple underneath, and while I didn’t need to add sugar to it, I wouldn’t describe it as being overly sweet. I didn’t try it with any cream or milk, because I thought that would ruin the flavour. It was a perfect holiday blend, and the waitress told me that it was also a staff favourite. My grandmother chose the chocolate mint tea, which really surprised me. While I didn’t have any, she said it was delicious. She said it didn’t really taste all that much like chocolate, but it went very well with the desserts. We both really loved the china that the tea was served in, and the tiered platter for the goodies. Everything was delicious, and presented beautifully. 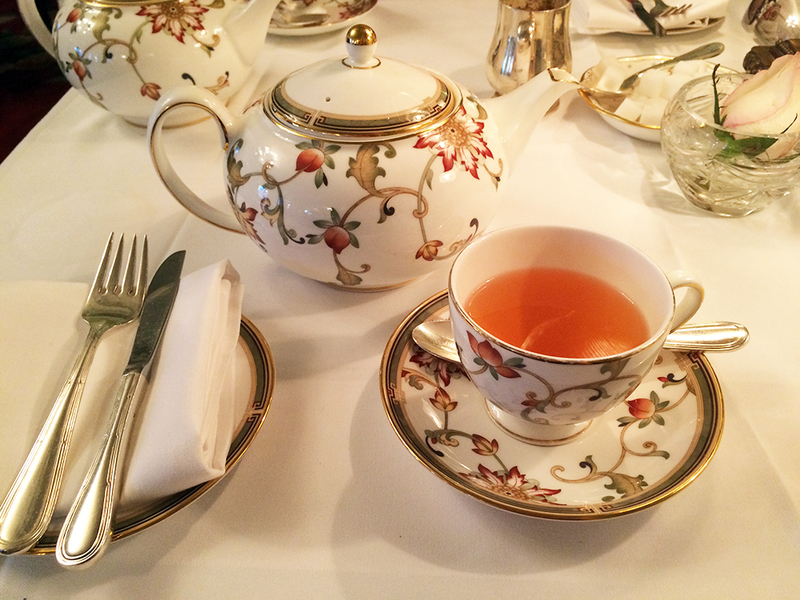 Afternoon tea at the Prince of Wales was definitely a wonderful treat, and at $34 a person that’s all it really can be. The atmosphere was lovely, and the decor in the drawing room makes you feel like you’re in an old movie. The waitress we had was really nice, and was willing to go that extra step to make sure you enjoyed your time. We were told when we chose our tea that if we weren’t happy with the taste, she would be more than happy to brew us a fresh pot of something different. 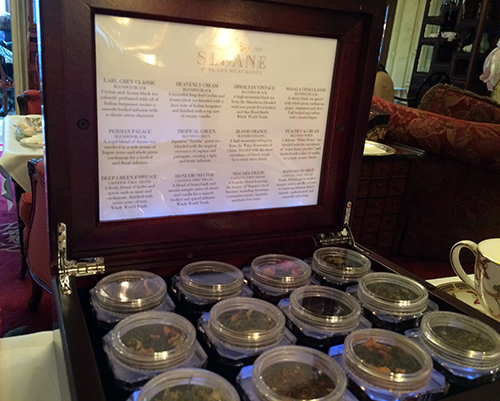 The tea itself was delicious, and I would love to go back and sample some of the other kinds. So if you’re ever in the Niagara-on-the-Lake area, I would definitely recommend stopping in to the Prince of Wales for some afternoon tea.